Charlotte Progressive Dentistry specializes in dental implants and dentures, helping people achieve natural-looking teeth that can be removed or fixed. Let our dentists help you achieve a beautiful and comfortable smile today. Family & Implant Dentistry With You In Mind. Our dental professionals are well versed in various dental implant and denture options, and we can help you choose the best dental treatment for you or a loved one. 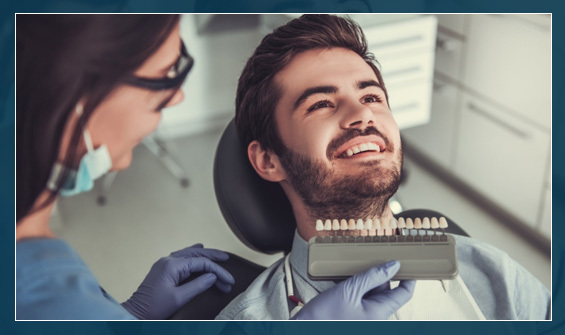 As a leading provider of modern dental treatments in North Carolina, our team is passionate about providing you with the best dental experience possible. To learn more about our dental implant services, contact our team today. Dental Implant Care And Dentures At Charlotte Progressive Dentistry! Dentures are natural-looking replacement teeth that can be removable, or they can be fixed to dental implants. There are two types of dentures: complete and partial. 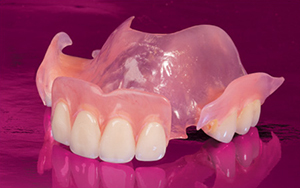 Complete dentures are made for patients when all of the natural teeth have been removed. They can be fabricated when you are already missing all of your teeth, or they can be made to fit your mouth on the same day you have your teeth removed; this way you will have your dentures the same day your teeth are extracted. This type has a metal substructure frame that is connected to your natural teeth and is used to fill in where permanent teeth have been removed. The metal frame provides strength and durability. 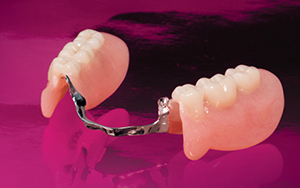 This type of partial denture is flexible and allows restorations to adjust to the contours of the mouth. Stain resistant, durable, and comfortable in the mouth, the flexible partial contains no metal or wire clasps. This, along with the natural hue of the appliance, allows it to blend with surrounding gums and dentition. 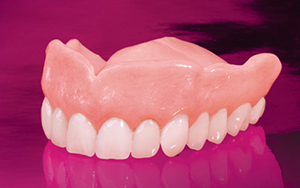 Just as with complete dentures, partial dentures can be fixed in place with dental implants. If you are concerned about your dentures moving, at Charlotte Progressive Dentistry, we offer a solution! We can place the implants necessary to permanently or temporarily attach your denture for better speaking and chewing. Please visit our Implant page to learn more about this process.